I have a confession to make. I don’t like the color peach. Or the color orange. Or any color that might be close to peach or orange. 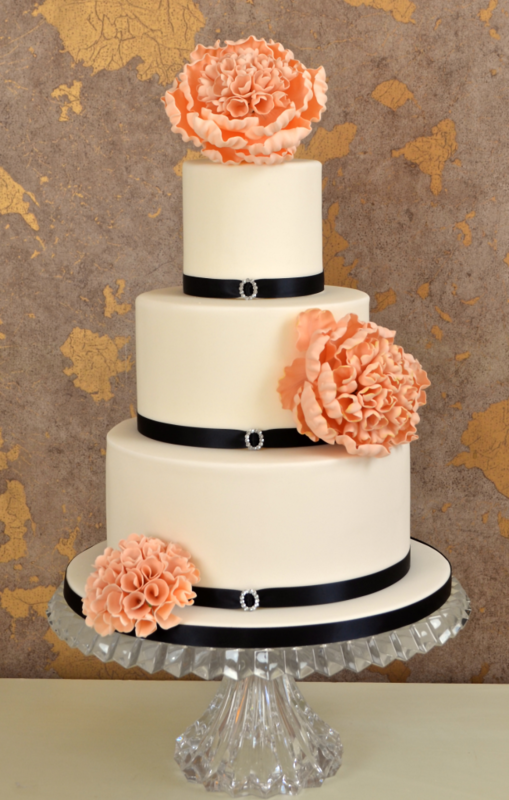 But, I love this wedding cake – peach flowers and all. Look at this cake! It’s so elegant and unique and gorgeous. And if I was getting married (again) I’d want this cake at my reception. The three-tier cake would be gorgeous without the flowers too thanks to the smooth white icing and the black ribbons with diamond-like brooches. That combination is something I’ve never seen on a cake before and I love it. But those peach-y flowers? They give this cake just the right amount of pop and color and take it to a whole new level of gorgeousness. And if you really don’t like peach flowers, I’m quite certain this cake would be lovely with dark red flowers too. You can find this cake here. It was created by Hilary Rose Cupcakes.